It was as early as May 1982 when Jim Corbett School, Kathgodam came into existence. Ever since those first few steps it has been a forward march. The School was hailed as a premier English medium public school of Haldwani. The school has constantly excelled in academics right from its inception in 1982. The school aims at an all round personality development of the students. The students learn to give and receive respect as they are groomed into citizens not only of this country but also of the world. To this end school strives to promote intellectual excellence ,uprightness of character, emotional maturity, scientific temper, spirit of healthy competition and moral sensitivity to the need and rights of others. Education is the manifestation of the perfection already in man. It is like a lamp in a case of iron. The ideal of all education all training should be thus man-making. The training by which the current and expression of will are brought under control and become fruitful is called education. 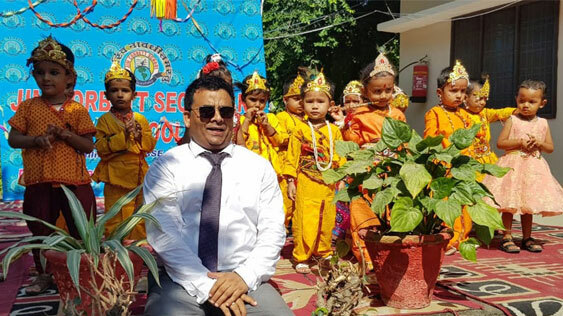 JIM CORBETT SECONDARY SCHOOL,Haldwani (Affiliated to C.B.S.E., New Delhi) aims primarily at the complete holistic development of child's faculties. The School aims at man making an enlightened soul in a perfect body. JIM CORBETT SECONDARY SCHOOL ,Haldwani aims at making the spectrum of school education learner friendly, contemporary and futuristic. Education is the manifestation of the perfection already in man. It is like a lamp in a case of iron. The ideal of all education all training should be thus man-making.